Earlier this year, Tony Mays was involved in three workshops with an Open Educational Resources (OER) component in three different parts of the world: India, UK and Trinidad. Each had a different focus and involved different role-players but in each case OER was part of a solution to a curriculum challenge that needed to be met. Adaptation of Hindi-medium resources developed in other states to suit the specific context of schools in Bihar. A third follow-up materials development workshop was recently held that was facilitated by a local partner. 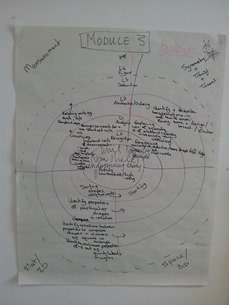 The core of the print-based material has now been drafted and attention has moved towards the development and/or sourcing of multi-media materials to address learning needs that can best be done using a variety of media; for example audio resources for language courses, animations for science courses and videos of classroom teaching to stimulate discussions integrating theory, practice and context. A guide to curriculum development emanating from this project was shared through the African Teacher Education OER Network on Saide's OER Africa website. The second workshop took place in Cambridge in England. This was also a follow up workshop to one earlier in the year and relates to a working collaboration between the College of Education at the University of South Africa (Unisa) and the oer4schools project in the Centre for Commonwealth Education at the University of Cambridge. As a result of a connection facilitated by OER Africa, Unisa and Cambridge have agreed to work together on the co-development of resources to support new Advanced Diplomas in Education in Mathematics Education, Science Education, Inclusive Education and Computer-Integrated Education. OER will be incorporated into the new learning resources and all jointly developed resources will in turn be shared back under a Creative Commons licence. The first workshop focused on conceptualising the project and designing example activities; while the second workshop focused on expanding sample activities into a full draft unit of learning. A third workshop is planned for the last quarter of the year. Although it is too early to share resources emerging from this collaboration, the oer4schools project has already developed a set of useful resources to support more interactive teaching in mathematics and sciences. In addition, the Unisa College of Education’s involvement in the project builds upon existing practice in incorporating OER into Education courses, for example the Teacher Education in Sub-Saharan Africa (TESSA) materials, and is in line with Unisa’s commitment to opening learning more broadly. What are OER and how can we find them? How can we publish OER? The second day focused on exploring stakeholder interests and concerns relating to OER and identifying key policy issues. The third day was then spent drafting, sharing and revising key policy positions to augment or to replace existing policy in order to create an enabling framework for positive engagement. The University of the West Indies in general, and ROYTEC in particular, see OER as supportive of a move away from content- and lecture-driven approaches towards more problem- and resource-based learning. The three workshops were therefore all quite different and took place under very different circumstances. What they had in common was intent to leverage the potential of existing openly licensed educational resources to take forward an identified curriculum need. The ability to source resources from multiple places, remix and re-contextualise them for a particular target audience in a particular context, is extremely powerful in support of changing pedagogy in this way.